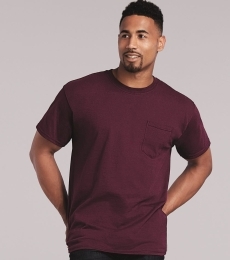 The 783 Anvil Adult Midweight Cotton Pocket Tee is the ideal tee to pick for those who want a comfortable fit from a familiar brand. This pre-shrunk, 100% ring spun cotton tee features a shoulder-to-shoulder tape and seamless collar. The 783 Anvil also comes with a double-needle neck, sleeve and bottom hem for a clean finish. The left chest pocket gives a stylish appeal to a classic tee for modern times. Available in different colors and made with a tearaway label, this tee is perfect for screen printing. Note: Ash is 99% ring-spun cotton/1% polyester. Heather Grey is 90% ring-spun cotton/10% polyester.